VHS might have revolutionized the home entertainment industry and changed the course of popular culture during the Reagan years, but it did no favors to the the art directors, cinematographers, and wardrobe designers who did their best to make movies look good back then. 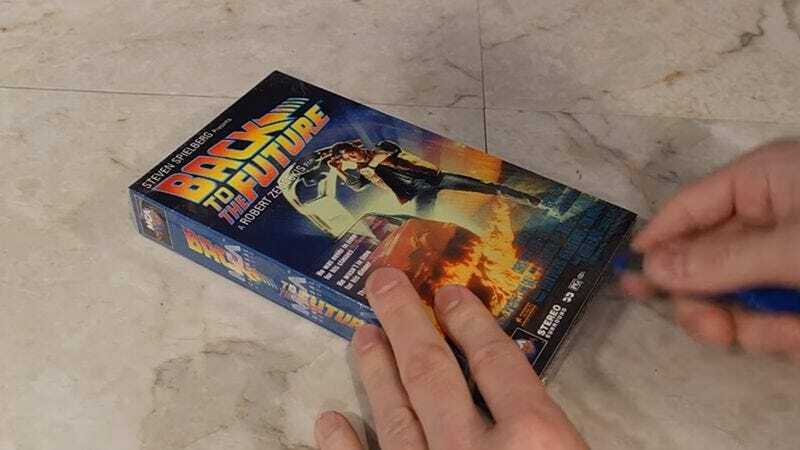 The host of The 8-Bit Guy proves this with a simple demonstration using three different editions of Back To The Future. He compares a version of the 1985 comedy ripped from Blu-ray with a commercially manufactured VHS tape. To round out the experiment, he also records the movie from live TV onto a professional-grade Maxell tape. The most amazing part of this experiment may be the fact that the host actually has a still-sealed, never-been-played copy of the movie on VHS. “I kinda feel bad for opening it,” he admits. “But I’ll do it in the name of science.” He also has to get his dusty old VCR back up and running for the first time in years. Alas, the tape was better off remaining sealed forever. Both the daytime and nighttime scenes disappoint in terms of picture quality, with the trees and columns in the background losing all definition and a weird halo effect forming around Michael J. Fox’s head. What’s interesting is that the homemade version, the one recorded from TV onto the Maxell tape, is actually superior to the one that MCA Universal was selling in stores. So even though it was never going to be great, VHS didn’t actually have to be so bad.